We "retired" our laying flock in September, when we processed the second batch of meat birds. I didn't come to the decision to take a break from poultry lightly. Our layers had a big fan club. Customers loved the quality of the eggs and the fact that the girls were out on pasture and were fed organic soy-free feed. However, the flock required a lot of work every day. I brought water and feed out to them in the morning and retrieved eggs several times daily. The electric netting was moved daily so they had a fresh patch of pasture each day. The chicken tractor was moved every other day. Add in weekly nesting box cleaning, periodic chicken tractor decon, egg inspection and packing and the amount of time spent daily tending the flock was not insignificant. When I looked at all the things I was doing on our farm and how I could regain some time to refocus on other things, the chickens became the "easiest" thing to eliminate, at least temporarily. Once I realized I still had to move the hoop house and prep it for winter chicken occupation, the chickens' fate was sealed. I sold some birds and the rest were processed as stew hens. It was a sad and very quiet morning after when I walked out of the house and realized there were no chicken chores. The farm was and still is very quiet without the background clucking and squawking of 70 chickens. We will have egg layers again, after taking a year off, because we believe so strongly that pastured eggs are better eggs. However, I will have to figure out how to do things more efficiently and make sure that I price our eggs so that we can actually cover all of our costs and be compensated for our efforts. The other big change I'll make for next year will be in the market garden. I'll grow fewer varieties of vegetables and try to grow more of the ones that are popular with my customers. I'll also not do a traditional CSA program but instead offer farm shares. I love the concept of a CSA and my customers enjoyed receiving a bag of fresh vegetables every week, but the additional workload involved on top of harvesting for the farmers market and store was more than I could handle alone. Instead, I'll offer pre-paid FARM SHARES (Sign Up Form available now!) that customers can redeem at the weekly farmers market. This will allow me to focus on growing for the market and store, harvesting just once each week. It will also mean my customers can select what they want, buying more or less as their needs change, rather than receiving a fixed assortment of vegetables each week. The time freed up by not having to put together CSA shares will be spent growing more and better vegetables. I also like the idea of encouraging people to go to the farmers market each week to get their vegetable fix. It could benefit all of the vendors to increase traffic at our friendly little market. The two changes above are the ones our customers will see right away in the coming year. There are a few more projects I'd like to complete next year that focus more on the farm itself and improving it for years to come. We want to set our farm up to be a diversified homestead with multiple perennial crops and areas for poultry or other animals, in addition to the vegetable market garden. I'm hopeful that the time saved next year by not having egg chickens and managing a CSA program will allow me to get these projects finished. I'll be adding a "thorny berry" patch in which I'll grow blackberries, raspberries and goji berries. We tilled up a large area for the new berry patch this summer and covered it with a tarp to kill weeds and grass. 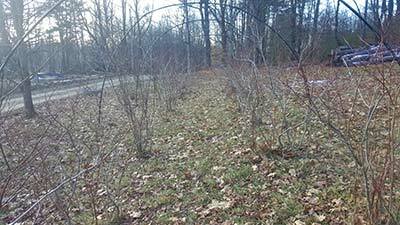 There is a scraggly blackberry patch already on the property that is overgrown and mixed in with other shrubs and weeds. The only way to control it is to mow it all down with the brush hog but that interrupts blackberry production as this variety produces berries on second year growth. A Canterbury neighbor gave us a bunch of red raspberry plants last year and I stuffed them into the edge of the asparagus patch in order to get them into the ground before the winter. I'd intended to relocate them into the new berry patch this year but ran out of time and now they are in danger of being overtaken by the blackberries and weeds. I started goji berry plants from seed this past spring and managed to get the young plants into the ground before the first snow. In the spring, I'll dig up the blackberries and raspberries and transplant them into the new patch as well. It'll take a couple of years before we see any significant production from this area but it'll be worth the wait to have these delicious berries on our table and at the market. Speaking of the aforementioned asparagus patch, I planted a decent sized plot of asparagus a couple of years ago. Unfortunately, it was into an area bordered by a pernicious perennial weed that spread like wildfire into the plot. Despite my initial efforts to control the weeds by digging them out, they soon got the upper hand. Short of nuking them with herbicides – not an option on our farm – I've decided to relocate the asparagus plants that survive the weedy invasion into an area I had covered in a tarp all summer. The old plot will be tarped next summer to kill the nasty weeds. I'll have to replace a number of asparagus plants but in a few years, we should have some spears to sell at the market. When we bought our farm, it came with a sizable collection of mature high bush blueberry bushes. They had not been pruned in a number of years but were producing a respectable number of berries. I started pruning out one or two old canes per bush each spring and the bushes responded with a lot of new growth. We've added a dozen new bushes and plan to add a dozen more. As with the other berries and asparagus, it will take a few years to ramp up production but we will have blueberries at the market in 2019. We planted a few apple and pear trees last year and hope to add more next year to create a small orchard. The apples will be for our own use, but pears may make an appearance at the market in a few years. The final big project we plan to do in the coming year is to open up more pasture. Over the years, the woods have crept in over much of what used to be pasture on our property. Trying to clear it on our own is too daunting so a contractor will cut and stump 2-3 acres and open up a connection between our back pasture and what we call the upper pasture. This will give us more room for pastured poultry, allowing us to keep the different species separate enough to avoid any disease issues. We will have room to properly pasture raise turkeys, something we are excited to try soon. We'd hoped to have the land cleared this fall so we could get pasture seed mix down and get a jump on the growing season next spring. Unfortunately, the wet fall has delayed the project until the spring, after the land thaws and dries out. 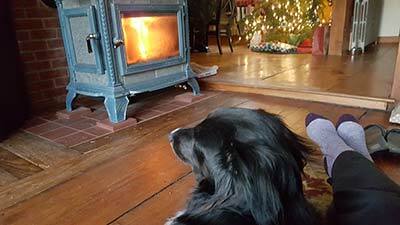 As we settle in for our winters rest, I look forward to curling up by the woodstove with the new seed catalogs and laying out next year's market garden. I'm hopeful that the changes I've made and will implement next year will make our farm more productive and efficient but also allow me to enjoy the very reasons I wanted to go down this farming path in the first place. See you next year! And just like that, it's Fall. The growing season is more or less over and I sit here wondering how the heck it got away from me. Back in March, with bright green seedlings under grow lights, I was full of the anticipation of the coming season, excited about the expanded market garden and my new CSA program. Then, suddenly I was off to the races and it was like someone turned on a blender for the next 6 months. The reality of managing a market garden, harvesting once for the weekly market and a second time for the CSA members, tending the laying flock, raising two batches of meat birds, all while trying to keep up with household tasks and life in general was shockingly difficult. Now, most sane people would have looked at the list of things I'd planned for the growing season and realized it was too much. Not me. I have just the right (or wrong?) mix of determination and stubbornness to not want to take someone's word for it - I have to SEE it for myself. It's not enough for someone to tell me that I shouldn't try to do it all in one year... no... I have to try it and fail in order for it to sink in. And it has. The season started off strangely, with early season greens taking much longer to grow than normal. My sugar snap and snow peas lagged behind so long that it was well into the heat of the summer before the first peas were ready to pick. I still haven't figured out why but my plans to have greens in May for the CSA and town store quickly fizzled. By the first outdoor farmers market, I had a good variety of produce and my tomato plants looked great, so I wasn't too worried. A few weeks into the market and CSA season, however, it became apparent that it was going to be challenging to keep up, even if nothing else went wrong. Of course, more went wrong. Multiple things. First, the weather. It was hot. So freakin' hot! And humid. 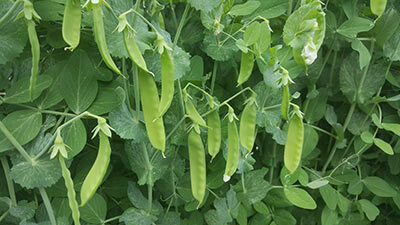 The peas peaked right at the beginning of a record 9-day heat wave with temps in the mid and upper 90's. I'd been picking and selling peas for two weeks when the heat wave hit. The peas, cool weather crops, turned into little straps of shoe leather, ending the pea season with hundreds of peas on the vine. In the middle of the heat wave, I realized my onion rows – planted with storage onions, scallions, shallots, garlic and leeks – were looking a little funny. A day later, they were in a full-blown downy mildew outbreak. There was nothing I could do to save the crop at that point. Downy mildew also took out the summer squash by mid- August and blight took the tomatoes around the same time. Rodents made snacks out of most of my mini peppers. They spared most of the hot peppers, leaving just a few with one bite taken. The garden wasn't the only challenge this year. Our egg laying chickens came out of their winter hangout with a bad case of mites. Treatment is relatively simple but we had 70 chickens so it was a time- consuming process. We treated them 3 times and totally decontaminated the chicken tractor in order to fix the problem. We also raised two batches of meat birds this summer. The first batch just didn't seem right from day one. The chicks seemed much quieter and less active than previous chicks. One spontaneously died the first week. As they grew, a few seemed to be walking funny. Meat birds grow at a freakish rate so any defect is magnified quickly. We ended up culling three birds due to deformities or illness. Out on pasture, the meat birds have shelter from the sun but don't have air conditioning. When the 9-day heat wave hit, it was less than 2 weeks to slaughter and they were clearly uncomfortable. In the middle of the heat wave, temperatures climbed into the upper 90's, with high humidity and no breeze. I brought cold water out several times and sprayed them down with cool water. Scott went out to check on them later and came back with the news that 10 were dead. Two more would die before we were able to rig up a box fan with a couple hundred feet of extension cords. Thankfully, the fan seemed to help and no more died. Death is a part of farm life but it's particularly hard when one feels it might have been something one did or didn't do. The next batch of meat birds was treated with kid gloves, including dragging out the box fan whenever the temperatures got even slightly warm. Thankfully, the second batch seemed much healthier and every one made it to slaughter. Throughout the craziness of the summer, I was keenly aware of the to-do list of house projects I'd hoped to get done. None was critical to the running of the farm business but they were projects I wanted to do to make our homestead feel more complete. It was frustrating to not be able to get any of them crossed off my list. The undone to-do list just added more pressure to an already stressful season. I read an article by Joel Salatin recently that helped me bring it all back into perspective. Titled "Incremental Accomplishments", in it Joel talks about how homesteads have their own pace and we do ourselves a disservice by trying to rush the process. He warns "...not to be too concerned about pace, but only to be concerned about progress. Confusing the two, or reaching for pace more than progress, derails everything." And he also says "don't let what's undone make you miss relishing the success of wholesome projects." Hmm. Sage advice from someone who has spent the better part of 40 years building his homestead and business. Perhaps I should take that into account? After much ruminating, I've decided to make some changes to what I do on the farm in the upcoming year. I'll detail more in future editions of this blog. For right now, it's back to the garden to tuck it in for the winter and begin the decompression/recharging process for next year. The good news is I've already been thinking and planning for next year. First on the list is to try to enjoy the journey, one incremental step at a time. There is nothing that brightens the darkness of deep winter for a gardener like the arrival of the seed catalogs. Like the Montgomery Ward toy catalogs of my childhood, they hold untold promise of bright and colorful things, all of which I must have. I always looked forward to their arrival because it let me know there was hope for lighter, warmer days ahead just when I'd officially slipped into my winter funk. This year, however, was a bit different. And it surprised me. As I've written about in earlier posts, the past year was challenging. Too many projects, too much taken on while trying to grow vegetables for sale at the farmers market and the store had taken its toll. By Thanksgiving, I was done. Soooo done. Like, didn't even want to look at the market garden done. As I geared up for Christmas, enjoying my respite from all things gardening, the onslaught of seed catalogs began. I remember holding the Johnny's catalog in my hands and thinking "NOPE." As each one arrived, I put it in a pile on my desk and continued on with my garden-free holidays. It was the first time ever that I didn't immediately dive into the world of garden possibilities. I wondered if the often heard warning "don't make your hobby your job or you will grow to hate your hobby" might be coming true. Not until January 2nd did I finally sit down with the pile of catalogs and start perusing the options. With my much-needed mental and physical break came a renewed sense of excitement and purpose. 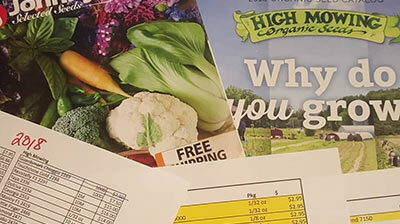 I dove into my favorite catalogs – currently Johnny's and High Mowing – cross referencing with my notes from last season and what I've learned about varieties my market garden guru JM Fortier uses in his ultra-successful market garden businesses. These days, my choices are mostly ruled by what my customers like and expect and what I can grow profitably rather than "ooh! That looks like fun!" I do allow myself a few fun things and this year it's wildflowers to attract bees and beneficial insects. The actual ordering process only happens after I've created spreadsheets with the varieties and quantities I want, by vegetable type, with separate columns for each company so I can compare what each has to offer of the varieties I prefer. Only after I've analyzed, compared and tabulated, do I actually place the orders. Inevitably, I'll decide I want something else, to try a new variety, or get more of something and so I'll place another order later on. 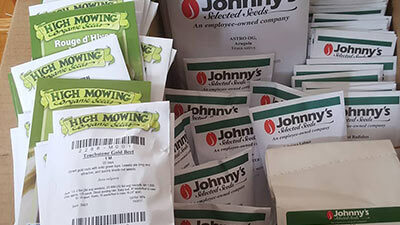 Getting the seed orders in is the gardener's version of turning in that term paper or finishing the big report - a sense of relief and then the waiting to see what shows up. The day the packages of seeds start to arrive is a little bit like Christmas morning. Opening the boxes, digging through to find the crisp new seed packets – Hooray! This year's "presents" were the largest collection of seeds I've ever ordered. The expansion of the market garden and the intensive planting techniques I've been honing mean I can grow a lot more vegetables than I've ever managed before. It's a bit daunting, but I'm excited to see if I can put my new skills and knowledge to the test and really crank out a continuous supply of the greens everyone seems to love along with a wide variety of the usual suspects. 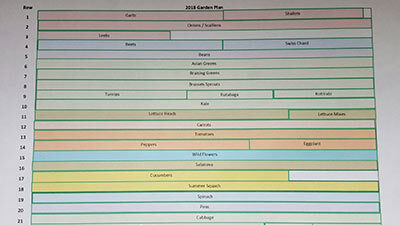 The next step in the march toward spring is developing my garden plan. I try to rotate crop types on a minimum three year cycle to keep pests and disease issues in check. 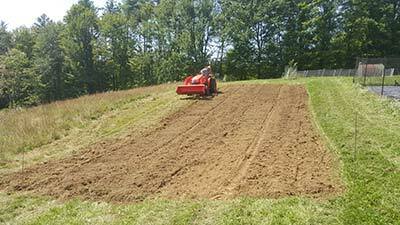 With the tilling up and re-orienting of our market garden last fall, the rotation schedule has been chucked. A good number of the new rows will run perpendicularly through soil that grew just about every crop type we grew over the past couple of years. I'll develop a new layout, grouping similar crops together in to blocks that will rotate across the rows in subsequent years. Again using spreadsheets, I'll create colored blocks and move them into the garden template until I've got a plan that seems workable. It's a bit like piecing together a quilt, trying to find where each piece fits. While I'm working on the garden plan, it's already time to start seeds under the grow lights. Onions and shallots are first since they require quite a long time when starting from seed. Then peppers, eggplants and tomatoes, first in cell packs and then potted up to 4" pots. Finally, greens like spinach and kale, as well as broccoli, cabbage and chard are sown into plug flats and crammed in under the lights. Lacking a proper seed starting greenhouse – a future project! 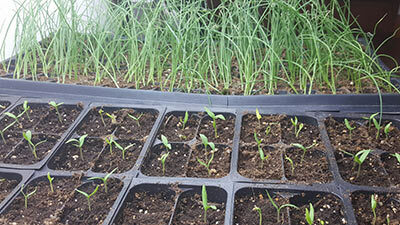 – the seedlings will have to be happy under the lights or on various windowsills until it warms up enough to put them out into the small lean-to greenhouse we built on our deck. For the first few weeks after I put the seedlings out there, many cold nights will force me to haul the flats back into the house for the night. Soon, it will be time to plant the first seeds and seedlings into the garden with the hope that a late frost doesn't zap my hard work into a mushy, frost bitten mess. It is the early spring, when the first wave of seeds sprout in the newly warmed soil, before the real work of battling weeds and pests begins, that fills me with such hope and excitement for the year to come. The cycle of the seasons continues onward and I can't wait to see what it brings. 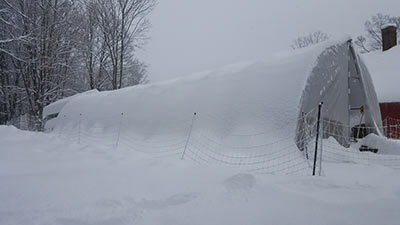 Winter has its grip firmly on our New Hampshire farm. Between snow storms, arctic blasts and the long dark nights, creatures great and small are just trying to hang on. I watch the chickadees and titmice go back and forth to the feeder full of black oil sunflower seeds and wonder how they manage to survive in the bitter cold. Winter is hard on us humans too. Everything takes longer this time of year. I spend a couple hours of my day checking on the chickens, making sure they have unfrozen water, plenty of food, and fresh bedding. Eggs have to be collected multiple times throughout the day to avoid them freezing and breaking. Each visit involves getting appropriately dressed for the adventure – Carhart coat, winter pants, hat, gloves, boots with microspikes on. I also wear a dust mask, as chicken dust is not good for the lungs. I feel like I did as a kid getting dressed up in my snowsuit, it taking so long and requiring so much effort that I'm sweating by the time I'm ready to go out. 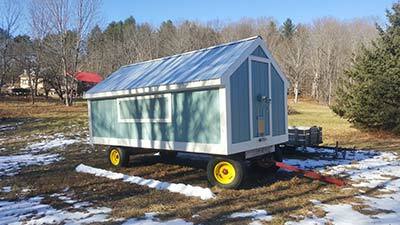 We built a 50 foot long hoop house and pulled the chicken tractor up to one end so the chickens would have a warm-ish, dry place to spend the winter. Chickens will do surprisingly well in winter, provided you select breeds that are suitable for northern climates. They do have a few important needs: protection from wind and drafts, dry bedding, and ample unfrozen water. The hoop house blocks the wind and snow (mostly) and keeps the deep bedding of mowed leaves, pine shavings and some straw relatively dry. We did discover one problem that we will need to resolve next year as it is too late to do much about it now. 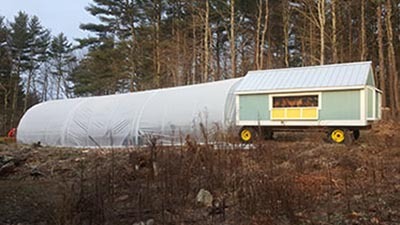 The hoop house sits parallel to and on a slight slope. Not a problem for the chickens – they don't seem to care about life on the slant. 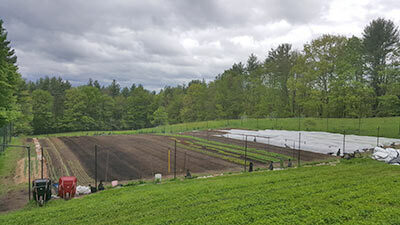 However, when it warms up – which has happened only twice in this frigid winter so far – the snow pack uphill starts to melt and the water runs downhill into the hoop house floor, resulting in patches of muddy water. Of course, the chickens think this is interesting and like to stomp and scratch away until the area is a muddy mess. Too long in the damp though is an invitation for mold and feet problems. So far, the problem has been resolved with a quick return to arctic temperatures and another bale or three of pine shavings. The spring thaw will be interesting, to say the least. We have plans to move the hoop house to a more level area next year and maybe put up some sort of barrier to divert meltwater. Farming is always a learning experience. Keeping the girls hydrated with fresh, unfrozen water is a challenge. We have one heated 3 gallon waterer to plug in and also ferry smaller 1 gallon waterers up to them throughout the day. Since the outside water faucets have been turned off, the chicken waterers have to be filled up in the kitchen sink. The filling part is easy. It's the flipping over of the waterer that is a challenge to my strength and coordination. Several times already, I have flipped over the 3 gallon waterer, only to have the bottom somehow pop off and 3 gallons of cold water go everywhere except back into the sink. Not fun and we will be revisiting watering options for next year. Once filled and flipped, the waterers then have to be hand carried to the hoop house. The hoop house sits up the hill and behind our house. The wagon I use during the warmer months is useless on the snowy, icy hill so water, feed, scratch, grit, bales of pine shavings all go up by hand in multiple trips. Between chicken trips, shoveling snow and loading in firewood, I have the makings of a solid winter fitness program! The hoop house is fabricated with fence top rail hoops so it is very sturdy and can handle snow loads. However, the plastic isn't as sturdy and since the hoop house is slightly tilted due to being on a slope and the plastic wasn't as tightly pulled as we would have liked, the snow doesn't shed off as readily as hoped. After each snowstorm, I go out and brush the snow off. It comes off easily but piles up along the bottom, pressing into the plastic. Scott and I then have to shovel the piles away from the bottom rather than use the snow blower since the slope makes it a bit tricky for the large machine. Also, the electric poultry netting surrounding the hoop house makes it difficult to get in there with equipment. Something else for us to reevaluate for next year. We are hopeful the plastic will make it through the winter and have repair tape at the ready should there be any major gashes. The chicken tractor is where the girls lay their eggs and roost at night. We built it with a steel mesh floor to allow most of the poop to fall through and air to circulate while keeping predators out. A future blog entry will detail the building of the chicken tractor – an interesting project for sure! For the winter, the open floor is a bit drafty so we stacked hay bales all around the bottom of the tractor, with a gap on the southern side for ventilation. 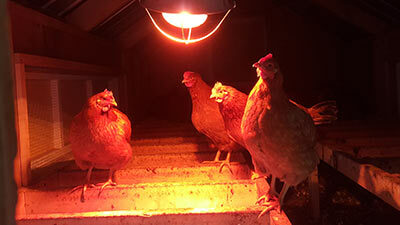 When the first arctic blast hit, we put a heat lamp inside, suspended from the rafters. 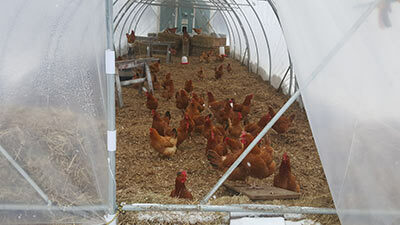 For the most part, the chickens don't sit directly under it but it probably warms up the overall temperature inside. It makes us feel a little better when we look out from our toasty woodstove-heated house and see the reddish glow coming out from the bottom of the tractor. In a few months, the harsh winter will be a distant memory for us and the chickens. 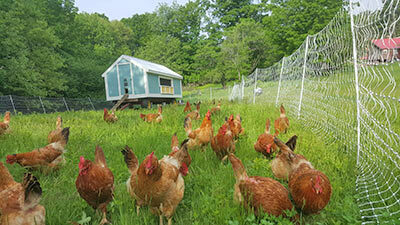 I like to imagine that as they sit in the doorway of the hoop house on sunny days, the chickens are dreaming of the green pastures they roamed in during the warmer months. My mind has already turned toward the greener days ahead. 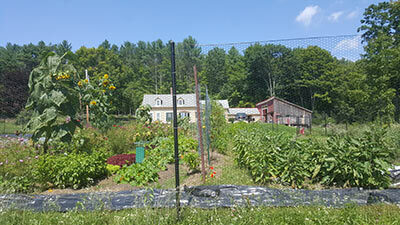 Sanborn Meadow Farm in Canterbury, NH is a self-sufficient homestead and working farm. Our vision is to remain small and local, meeting the food needs of our community and supporting other local businesses. We sell vegetables, some fruits, pastured poultry and eggs. Read more!